Both the sauce and risotto require approximately the same cooking times, the sauce needing slightly more. So as you’re setting this up, start with the sauce, and once you’re ten minutes in or so, start the risotto and both should be ready at the same time. Trick of the trade: warm your serving plates in a 200 degree oven to prevent the sauce and risotto from seizing up. This will help maintain that beautiful, creamy texture. Continue to stir the risotto while adding ½ cup of the broth at a time, adding more only when each portion is absorbed. Once 2 cups of the broth have been added, add the mushrooms. Prepare your plates by heating them in a warm oven at 200 degrees. This will help prevent the sauce and risotto from seizing up. 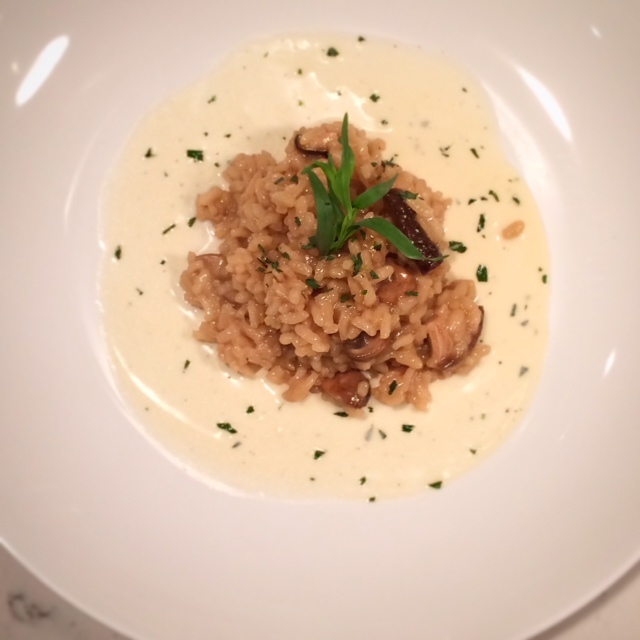 Spread the tarragon sauce on the plate and serve the risotto on top of the sauce. Garnish with a sprig of tarragon, if desired. In a large saucepan, over medium-high heat, bring the wine, onion, pepper, and whole tarragon sprigs to a boil. Reduce heat and simmer, uncovered, until the mixture is reduced by two-thirds, 20 to 25 minutes, depending on size of pan. Remove and discard the tarragon sprigs. Add the cream, reduce heat, and simmer gently until slightly thickened, about 15 minutes. Strain the sauce through a mesh sieve into a small sauce pan, reserving the onions for a later use. 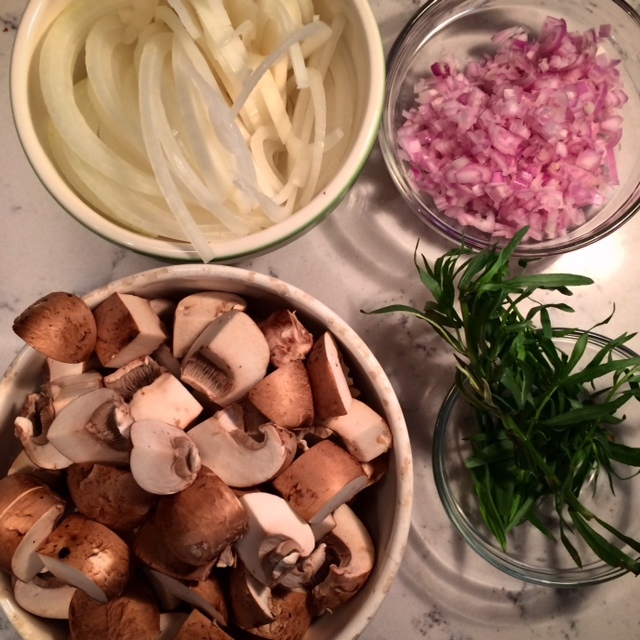 Put the sauce back on a low-medium heat, add the salt and chopped pieces of tarragon. Cook an additional 2-4 minutes.